The Scheme’s ‘Scheme Heroes’ initiative aims to recognise and reward individuals who consistently conduct themselves in an exemplary manner, serving as positive role models for the entire industry. Their personal contributions should be consistently positive and proactive and conducted without obvious incentives, delivering a high level of performance in line with the Scheme’s Code of Considerate Practice. An individual who operates at the ‘coalface’ of activity such as gates-men, operatives, banksmen, cleaners, liaison officers or canteen staff – those whose day-to-day work can often go largely unrecognised but who play an integral part in any site’s operation. Someone who diligently performs his or her duties day-in-day-out, but also goes the extra mile in any aspect of the Scheme’s Code of Considerate Practice, adding extra value to your organisation and the industry as a whole. Someone who has made particularly strong links with the site or community and has become the approachable and friendly face of construction as well as a fantastic ambassador for the organisation and or the construction industry. Someone who has implemented an innovative practice on one of your projects, potentially reducing accidents or injuries or whose work has made a huge difference to the overall consideration of the site, to those either working on it or who are affected by it. Each contractor must themselves identify and nominate those working in their companies who they feel warrant such recognition. 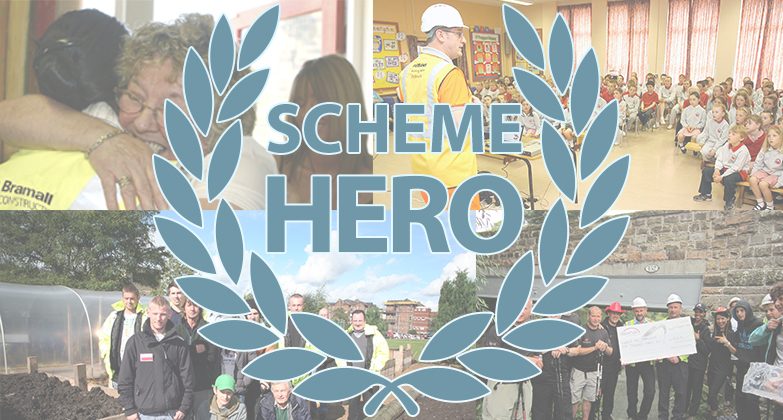 As much information as possible about the potential Scheme Hero should be provided including, where appropriate, photographs, compliments from members of the public, or other relevant information. Contractors are asked to ensure that the narrative provided on the nomination form is written in a style that could be published on the Scheme’s website alongside details of the Scheme Hero and the company name/logo – comments from others including the nominator may also be used in the narrative assuming a nominee is accepted. There is no limit to the number of nominations that can be submitted. Nominations will also be accepted for sub-contractors and site neighbours. All nominations will be reviewed by a Scheme-appointed committee to ensure the nominee meets the agreed criteria. The nominating contractor will be notified of the committee’s decision in a timely manner. The aim will be to approve all nominations and only reject any which are clearly inappropriate when considered against the criteria. Any which appear to be valid but where the narrative is not deemed to be sufficient for publication, will be returned for amendments. 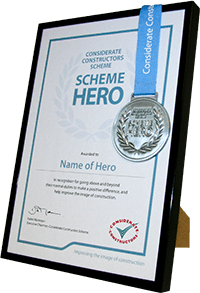 All approved ‘Scheme Heroes’ will receive an electronic copy of their Scheme Hero certificate. The nominating contractor should arrange for the winner to be presented with their certificate and medal by the most senior person possible from their company or community. The nominating contractor should arrange for photographs of the presentation to be taken and sent to the Scheme.